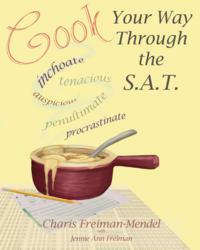 Improve SAT Scores With Simple Test Prep Tips From Charis Freiman-Mendel, Author of "Cook Your Way Through The S.A.T." While overall SAT performance has dropped, SAT scores at the top end of the scale have actually increased, making the admissions process for elite schools more competitive than ever. Charis Freiman-Mendel offers winning strategies for SAT and standardized test preparation based on methods used in her book, "Cook Your Way Through The S.A.T." Every word added to a student's word bank is an investment in the future. Charis Freiman-Mendel, author of Cook Your Way Through The S.A.T, recently participated in a BlogTalkRadio conversation with CollegePrepExpress, discussing best practices and winning strategies for SAT and standardized test preparation. Freiman-Mendel offered test prep techniques she used to write her book and to prepare for admission to her first choice high school, Choate Rosemary Hall. SAT scores for the entire class of 2011 continued the downward trend that started ten years ago, but not so for the subset of students aiming for admission to top tier colleges and universities. SAT score data shows that scores at the top end of the scale have actually increased, making the admissions process for elite schools more competitive than ever. Vocabulary and reading comprehension form the verbal section of all standardized tests given in middle school and high school and are important skills needed for the essay writing section of these tests. Freiman-Mendel targets test prep for the verbal section of the SAT as an area in which strategic planning can translate to significantly improved scores. Her verbal scores rose dramatically between the time she took the SSAT practice test and the SSAT that counted for admissions. The key component of Freiman-Mendel's strategy is to leverage time, because "slow and steady wins the race." Students should begin to learn standardized test vocabulary years before taking the test(s). The same words appear again and again on all levels of standardized testing so every word added to a student's word bank is an investment in the future. A student who learns just one word a day from middle school on, will acquire 365 words a year for 8 years, or 2920 words by the time that student takes the 11th grade SAT! Cramming is clearly not a winning SAT test prep strategy. Her second point is that memorizing lists of words offers little return on the effort because without context, students don't learn the nuance of vocabulary. The College Board routinely tricks students by using slightly different definitions than those appearing on common word lists. Words that are learned in context and through associations and connections using all five senses are truly learned, not memorized. Freiman-Mendel recommends that students practice using new words by incorporating them in homework, texts, emails and social media interactions that can help make them a permanent part of their vocabulary. Reading interactively with her "read, circle, lookup" strategy also improves vocabulary retention. Cook Your Way Through The S.A.T. offers cooking as an innovative teaching tool to help students learn 1000 vocabulary words while having fun. 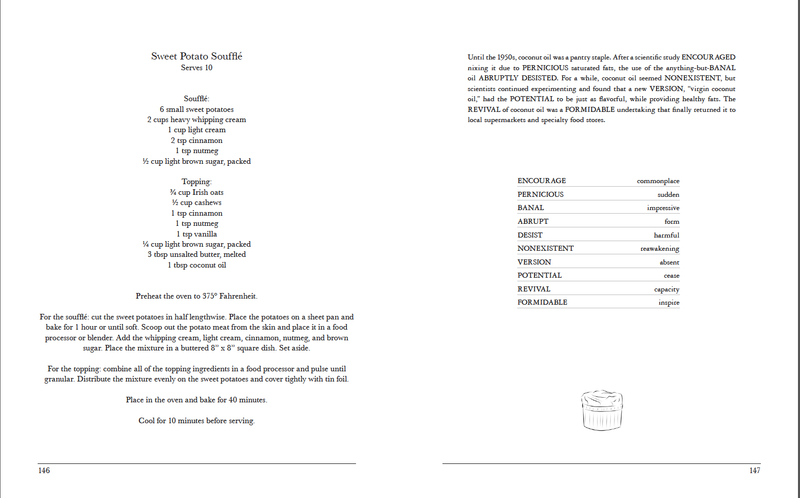 The book pairs each of 99 recipes with a "fun fact blurb," a short paragraph about the recipe. Each blurb contains 10 SAT vocabulary words and is followed by a vocabulary match test. Each recipe, blurb and word list is meant to be used as a lesson. Assembling recipe ingredients and cooking each dish provide context for the vocabulary and sensory association for the words. Learning occurs when students are engaged in an interesting and meaningful activity. Moms, Dads and grandparents can get in on the fun! Like it or not, top tier colleges and universities continue to rely heavily on SAT and ACT scores in the admissions process. The College Board, Educational Testing Service and ACT claim students can't "game the test" by preparing. Freiman-Mendel begs to differ. Test preparation can dramatically improve test results and help students gain admission to top tier colleges and universities. "Cook Your Way Through The S.A.T." helps students beat the College Board at its own game. "Cook Your Way Through The S.A.T". is available through Amazon and other booksellers. For more vocabulary, great recipes, book and restaurant reviews, and standardized test prep tips, follow Charis Freiman-Mendel by subscribing to her website, http://www.SATgourmet.com and LIKE her Facebook fan page, Cook Your Way Through The S.A.T. Please direct media and other inquiries to Charis via email: Charis(at)SATgourmet(dot)com. Cook Your Way Through The S.A.T.